Batman the Dark Knight Returns Part 1 Blu-ray Review. 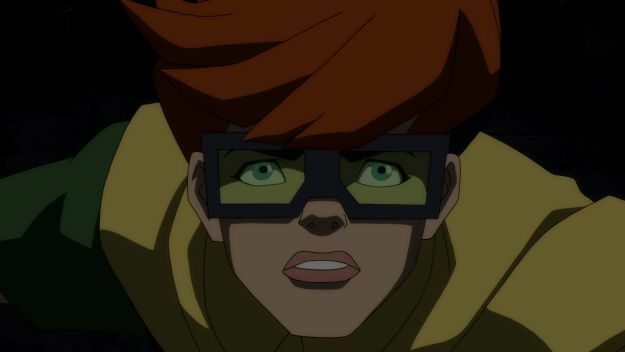 All in all Batman: The Dark Knight returns Part 1 is excellent. With an estimated $3,500,000 budget, Warner and DC Entertainment set out to take on one of the true classics of graphic novels is a daunting undertaking to say the least. 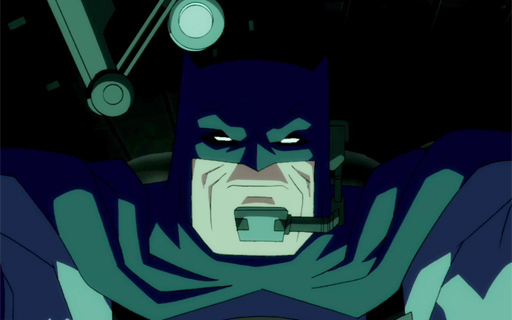 When the story comes from Frank Miller during the time when his stories bent what we at the time took as our comic book characters and accepted them as the simple comic book fodder they were…miller’s story The Dark Knight Returns electrified the genre and the character into a truly complex character. The Dark Knight Returns shakes it all up and keeps the inner essentials of what we all love of The Batman as a character. The story is spectacular and brilliant in its timing and story elements. 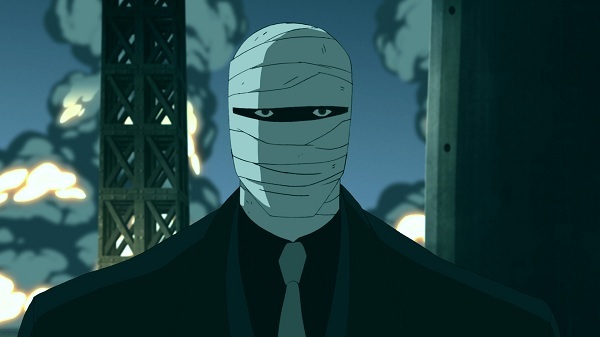 This latest endeavor with the animated telling of the story keeps it fresh, tweaking just enough to make it fresh if you know the story already and to keep it as one of the essential Batman tales to ever be told, and now to own on Blu Ray and DVD. 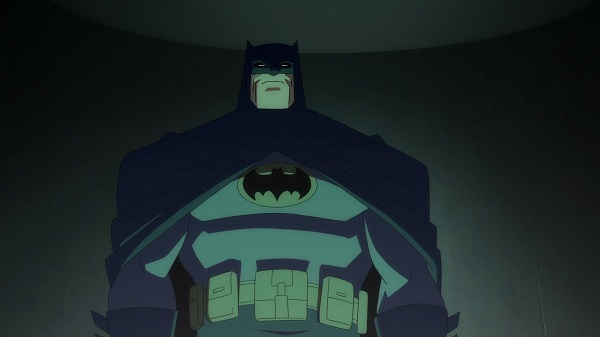 We are taking a look at the Blu Ray version of Batman: The Dark Knight Returns part 1. Warner and DC rightfully and wisely decided to split the adventure into two animated films so as not to water down the iconic tale. 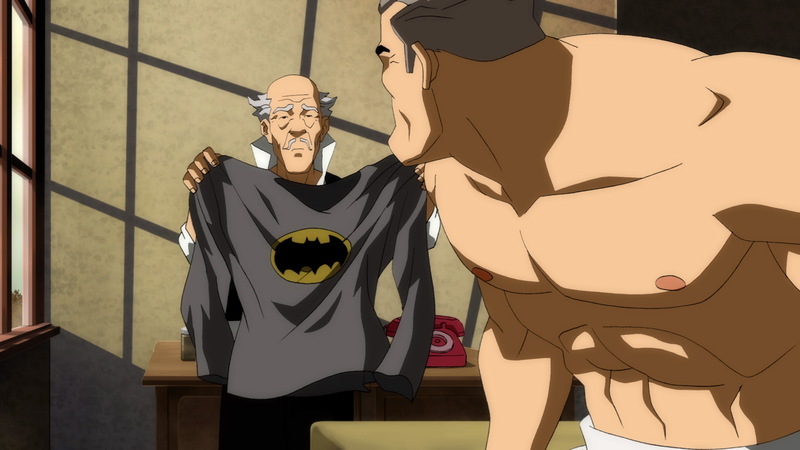 It’s been 10 years from the last sighting of The Batman. Villains we knew of during the Dark Knights time are pretty much gone, many locked away in various states of broken and battered psyche. Some like The Joker a vegetated shell of their former selves and then there is Harvey Dent, who doctors have worked very hard to heal the physical scars that Dent has suffered with for so long. Gotham is getting from bad to worse now though, as a new form of danger plagues the city. A Mutant gang that seem to have no moral compass by any stretch is escalating in their acts of violence and have even publicly announced targeting the soon to be retired Police Commissioner Gordon. Bruce Wayne is introduced more or less enjoying retirement for all these years from the cape and cowl, now pushing himself to their limits in other billionaire playtime endeavors such as car racing. The portrayal is not unlike watching a Tiger now in a large zoological compound bored with not being able to hunt for its own food anymore. Wayne’s fight with the one enemy we all succumb to eventually…time and age…. is portrayed very well in this animated film. The character struggling with his purpose and events that sent him on a crash course with fighting crime in the unyielding darkness that is Gotham soon collide with mortality staring him in the eye. Here those events play out in the characters mind again, playing on screen in a gut punch of unblinking tragic violence of Bruce Wayne’s parent’s murder… that steals away a child’s innocence and plants the seed of what is to come. Soon with all the escalating violence the tortured thoughts collide even more and Wayne dons the iconic costume once again. He goes on a one man army crime fighting spree. Playing out on screen and giving shadowed hints of the Dark Knight as he is seen but not seen by enemies and the innocents he saves, the fan boy in me could not help but to let out with a delighted giggle. The Dark Knight indeed has returned. The characters inner monologues that flesh out much of the graphic novel is absent here, though so spectacularly presented it is un- needed. Some dialogue has been added where needed to aid the flow of the story and it all fits oh so well. One of the best scenes that shows so much and delivers the same message without the internal dialogue is a certain interrogation from a rather high place. The terror filled scream of the mutant thug when they at last see where they are is priceless. 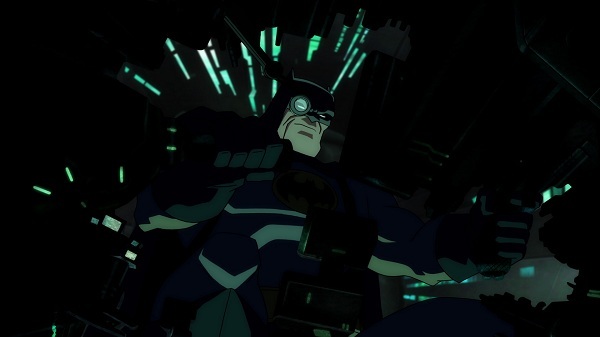 The intent of the characters is presented by the animation storytelling and the excellent character voice acting by the likes of Peter Weller who brings the older Dark Knight a sense of weary experience. Delivering classic lines like the mud pit being an operating table and him being a surgeon. 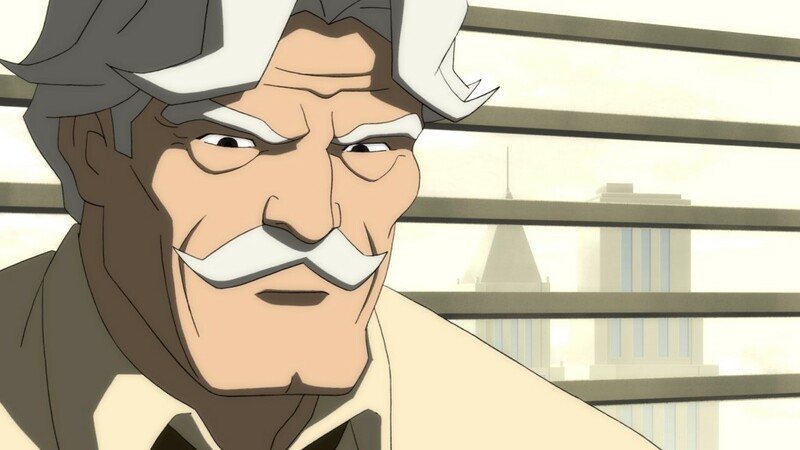 While I am a long time Kevin Conroy fan as the voice of the Dark Knight, Peter Weller put the edge and bite to this older character. Stiff delivery at times, but one could imagine this older character. Much like Ariel Winter puts the spark and believability into the first female Robin. The entire voice cast in this feature hit the mark and then some on these characters making them all believable, and better yet...animation alone could not sell this story. ALL voice actors made characters likable and at times horrifyingly reprehensible. 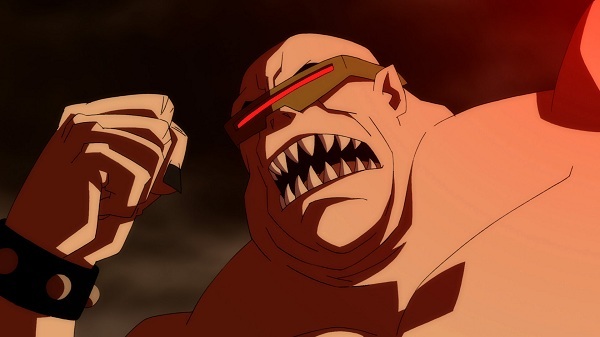 Having the Graphic novel for many years and hearing that DC and Warner Animation were doing this two film adaptation…I have to admit I was a bit concerned on how it would turn out. Those fears are lay to rest. We will of course be adding the second part of this review when Part two comes out in a few months. Till then on with the rest of my thoughts on the presentation. Animation presentation is very good indeed. 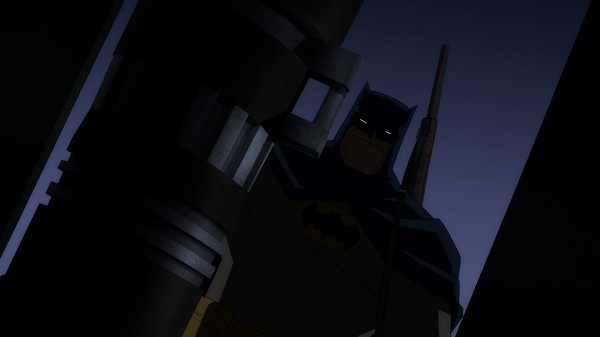 Batman: The Dark Knight Returns Part 1 Blu Ray presentation is what animation should look like in high definition. Even some of the slight banding artifacts that creep in on some of the night scenes with lightning flashes do not make it less enjoyable. It’s not distracting in the least. In fact, on the first run through to get a good feel for the story and character, it’s not really even noticed. Just on the second run through when scrutinizing for such things did I even take notice. Dark colors are as bleak as they should be, and when there is color that comes in the brighter spectrums, they are nicely vivid. Characters and back ground all play out and look spectacular, even the renditions of iconic visually such as a silhouette of The Batman leaping through the night, look darn good even with the bits of banding. Warner delivers a very nice DTS-HD Master Audio 5.1 surround track. While the sound mix is very good, with dialogue coming across very clear even amongst the heavy action… for some reason the rear speakers just do not get much of a work out here. Panning sound, gunfire, explosions all sound as heavy hitting as every punch landed on an enemy’s face. The musical track interwoven throughout the film lends itself well, in a seamless undertone at one point and then building into a crescendo of crashing action when it calls for it. 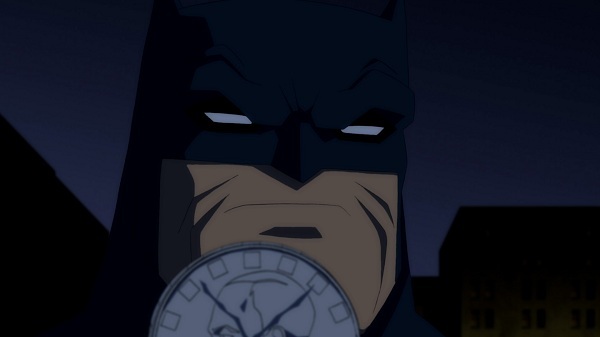 All in all Batman: The Dark Knight returns Part 1 is excellent. Featurette – “Her Name is Carrie … Her Role is Robin” – An all-new featurette. Experience the role of Robin, through the eyes of a female warrior. Featurette – “Batman and Me: The Bob Kane Story” – A documentary comprehensively chronicling the remarkable life of the creator of Batman. 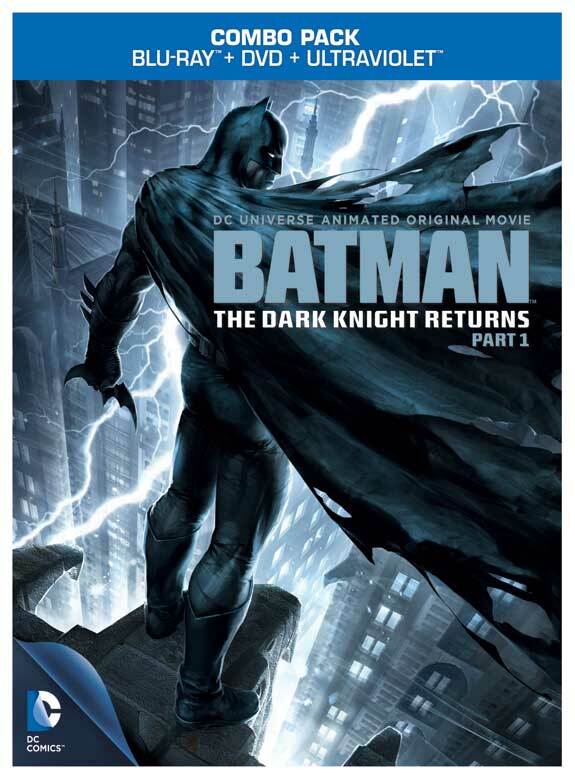 These bonus features offer great stuff for any true comic book fan. Have fun, play games. Grab a copy of this film!